Welcome to Yanagawa Kanko Kaihatsu K.K. website. 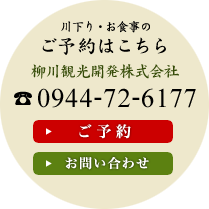 Also, thank you for choosing our company, Yanagawa Kanko Kaihatsu. Yanagawa is a representative place where still retains an old atmosphere of the castle-town as the Tachibana family had once prospected a clan worth 120,0000 koku in the Edo period, around 1600. Yanagawa is also known for a great poet called Hakyshu Kitahara who composed a number of poems based on Yanagawa riverside district. Moreover, Yanagawa is a place with enjoyable food such as grilled teriyaki eel on bamboo steamer and delicacies of seafood from Ariake sea.